Although Disney has confirmed that it won’t be rehiring James Gunn’s to direct the third installation of Guardians of the Galaxy, fans aren’t ready to let Disney off the hook. A GoFundMe campaign that began raising funds on 20 September to erect billboards advocating for Gunn’s return has put up its first ‘Rehire James Gunn’ sign in Garden Grove, California, approximately four miles from Disneyland in Anaheim. 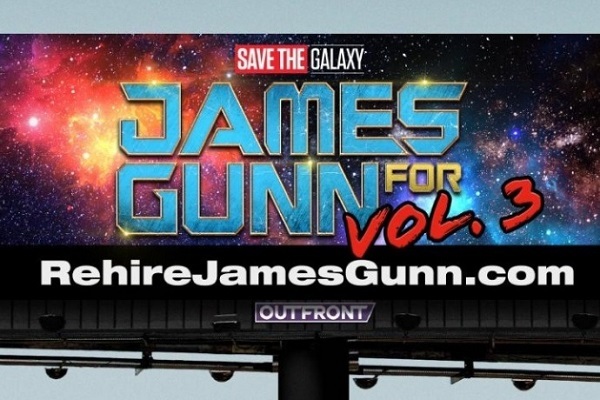 The billboard reads, “Save the Galaxy: James Gunn for Vol. 3” and directs viewers to RehireJamesGunn.com. Gunn was fired due to controversial jokes he had made on Twitter several years ago. Gunn’s firing was condemned by Guardians actor Dave Bautista, while the rest of the cast signed an open letter in support of their former director. Giuseppe Cincinnato, one of the individuals behind the billboard, said that the campaign isn’t “just all online outrage.” Cincinnato said his team loves Gunn as a creator and that this campaign is a way to tell Gunn how much support he has from his fans. Even though this might not change Disney’s decision, Cincinnato explained that the fan group was determined to show how important Gunn is to them and to do what’s right. The fan group paid US$4,000 to erect this first billboard. It will continue to raise money on its GoFundMe page for other signs, to be erected nearer to Disneyland ahead of Christmas. The current billboard is located at the 13541 Newhope Harbor Boulevard exit. In the meantime, Gunn has been confirmed to be writing the script for Warner Bros.’s next Suicide Squad film.